Visit Spring Open Studio at Hunters Point Shipyard, May 4 and 5, 2019, from 11am to 6pm. Please see below for directions. Crampton was included in the Earth Action Initiative Conference at UC Berkeley on March 23, 2019. Let's get to work on this planet stuff! Also look for Crampton's "Cowboy Boots" at the 57th Annual Neighborhood Art Show at the S.F. Public Library Potrero Hill in May–July. Crampton has lived on Potrero Hill since 2004 and spent many years painting landscapes around the hill. Crampton will be showing a whole series in the exhibit "Play Date" at the FireHouse Art Center in Pleasanton, CA in July through September. From January through April, Crampton's work will be on exhibit in Potrero Hill's Goodman2 art complex along with Anaheeda and Sofia Carmi. Come visit the painting studio! I'd love to have you anytime but please make an appointment. >>Click here for directions to the studio: Building 101, Studio 1223. GPS: 451 Galvez Avenue, San Francisco. Since the 2016 presidential campaign, Crampton has been creating political cartoons. See the cartoons on >>Facebook, Twitter, Instagram, or at the >>Laugh About It Website. When it's all over, Crampton the cartoons will be available in book form—though it's getting to be a large book!—and the artist plans to return to making funny rabbit books. Crampton's latest storybook, Ladybird: My Eight Lives may help children have empathy toward their pets. Available at bookstores everywhere. 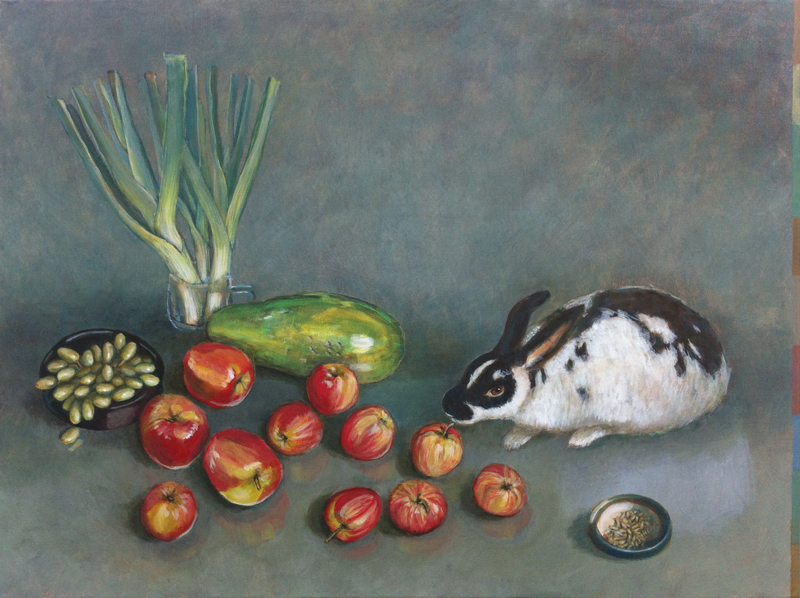 Still life with Papaya and Rabbit, acrylic on canvas, 30"x40"x2"